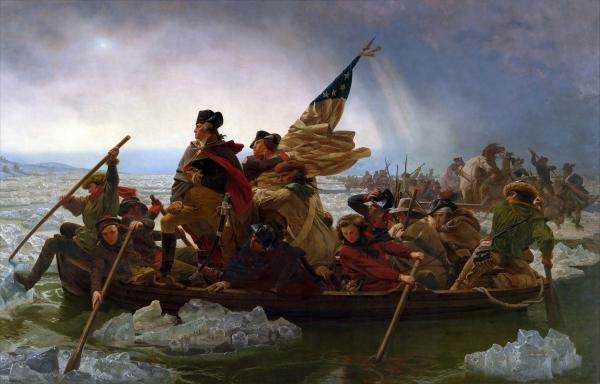 George Washington Crossing the Delaware, by Emmanuel Leutze, 1851. One of the most famous and iconic of all American historical images, George Washington Crossing the Delaware was painted by German artist Emmanuel Leutze seven years before he moved to the United States. The painting has numerous historical inaccuracies, including Leutze's inclusion of the Stars and Stripes and jagged ice flows. Attacked during World War I as pro-German propoganda, the massive 21-by-12 foot canvas was removed from the walls of the Metropolitan Museum of Art in New York City, rolled up, and stored in the basement until it was rehung in 1932 for the 200th anniversary of Washington’s Birthday.